"This is one of many variations I have tried. I use my oven. If you have a food dehydrator, be sure to follow factory instructions. I store mine in a plastic jar. No refrigeration needed, and it keeps for months." In a medium bowl, combine the soy sauce, ground black pepper and brown sugar to taste. Mix well and add the steak slices. Place entire mixture with meat into a sealed plastic container and refrigerate for 12 to 24 hours. In the oven, place one oven rack on the highest rack setting and one rack on the lowest setting. Place a piece of aluminum foil OR a baking sheet on the lowest rack, to catch any drippings. Preheat oven to 160 degrees F (70 degrees C). Insert a wooden toothpick through the end of each slice of meat, and suspend each slice from the top rack in the oven, using the toothpick as a support for the slice. Bake at 160 degrees F (70 degrees C) with the oven door propped open to allow moisture to escape. Bake for 6 to 8 hours depending on thickness of slices. Jerky should bend, and not snap. 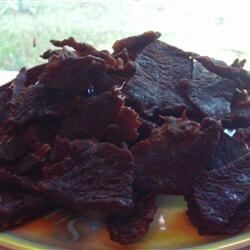 High protein is all the rage and this beef jerky recipe doesn't fail! Waiting 8 hours is sooooo hard. Your home will be filled with a wonderful aroma (use your exhaust fan). I added about 1 tablespoon of cracked black pepper and red pepper flakes. Delicious! My family thought this recipe was better than the T-Bird's recipe for Beef Jerky. It is pretty straight forward recipe and the results are great. I would of never thought you could make something like this without a dehydrator. One of the benefits of this recipie is that all the salt in Soy sauce preserves it. You don't need to add any additional salt to this.